The plan was for 50 concerts in London, and it was a sellout. 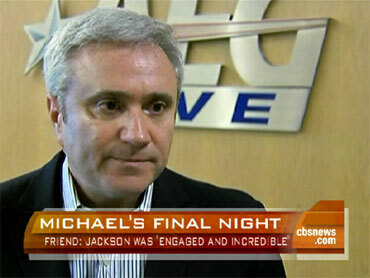 CBS News correspondent Richard Roth reports that Michael Jackson's fans spent around $85 million snapping up 750,000 tickets within five hours of seats going on sale. London wasn't just to be Jackson's musical comeback, it was to be his financial climb back from mounting debt. He named the tour with a phrase he kept repeating: "This is it. I mean this is it." The concert series was due to kick off just 12 days from Wednesday, rehearsals had been well underway and Jackson was "fully engaged, and incredible," according to concert promoter Randy Phillips, who rushed to the hospital last week just as Jackson was brought in. "They brought him in on a stretcher and they put him into the ER. I was sitting in a chair right outside the actual room, the operating room, and there was tons of activity and they were trying to resuscitate him and save him," Phillips recalled. Told there was no hope, Phillips said he immediately thought of Jackson's three children. "They were around the corner in a room, and who was gonna tell them? That was the first thing that hit my mind," the promoter said. "And then the fact that we've all lost this incredible talent. He was a very, very kind, very soft-spoken... He was smart, he was clever." Phillips said he was standing in the doorway when Katherine Jackson was told her son had died. "The reaction was, you know, what a mother's reaction would be; Disbelief and stuff like that. But she pulled herself together and is the matriarch of that family, and it's a very diverse family. As the matriarch, she was strong and impressive." "I actually spoke to her last night and told her that I was beyond impressed about how strong and how together she kept everybody," Phillips said of Mrs. Jackson. "Right to the point where she was just out shopping in the Target, buying toys for the kids." "The question now confronting the businessman with a huge investment in the Jackson brand, is what happens next. And his answer seems to be that the show, or some version of the show, should go on. "At some point, the world needs to see this production," Phillips said. "I would imagine if we could do it, it would be done as a tribute... with the brothers performing and some sisters and stuff like that, but also the stars who love Michael and were influenced by him." "The world needs to see this production," Phillips emphasized. "It's done, we have it, we have it in a vault, the intellectual property content, we have the sets, we have everything, the costumes. It would have been, which is the tragedy here, one of the most amazing arena shows ever." The timing of any such tribute concert series is uncertain, but Phillips says the sooner, the better. Just how much money Phillips stands to lose isn't known. Some reports claim his exposure could be as high as $500 million, with insurance covering just a tiny fraction of that. Asked if he's lost money because of Jackson's death, Phillips replied: "I lost one of my closest friends, so it's not about money, necessarily."